I’m just gonna go ahead and call this the week when I decided to share all the ice cream. Summer’s coming to an end, and will fade into Fall before we know it. And I have so, so many yummy frozen treats to share with ya’ll that I don’t even want to waste another second dragging it out. So you’ve been warned! Stay tuned the rest of this week and next for some totally tasty refreshing snacks and desserts coming your way. 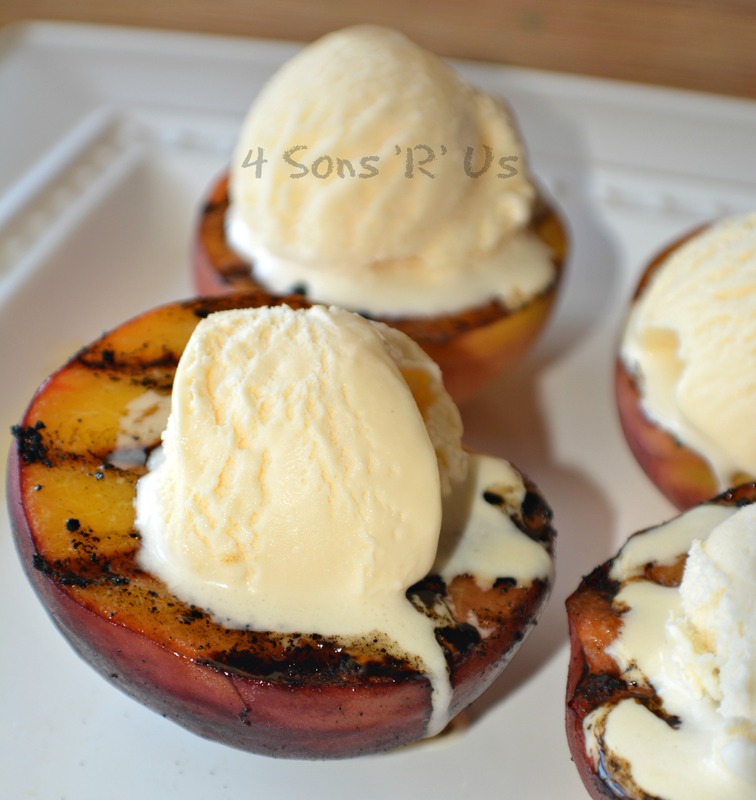 And there’s no better way to kick this bonanza off than with Grilled Peaches and Vanilla Ice Cream. Peach picking season is in full swing around these parts at all of our local orchards. And if you’re skeptical at the idea of grilled fruit, or even grilled fruit as dessert, let me stop you right there. Grilling these babies is quick and easy, and caramelizes the sugars in a way that can’t be described, just tasted. Add a pinch of brown sugar to the mix, and they make the perfect ‘bowls’ to hold a hearty scoop of your favorite vanilla ice cream. It’s like the ice cream and pie of 2015, minus the crust, and well … pie. But I’m sure you get my meaning. Just like the granny smith apples and flaky crust in my Mama’s apple pie, these two were meant to go together. Heat grill to medium high heat. 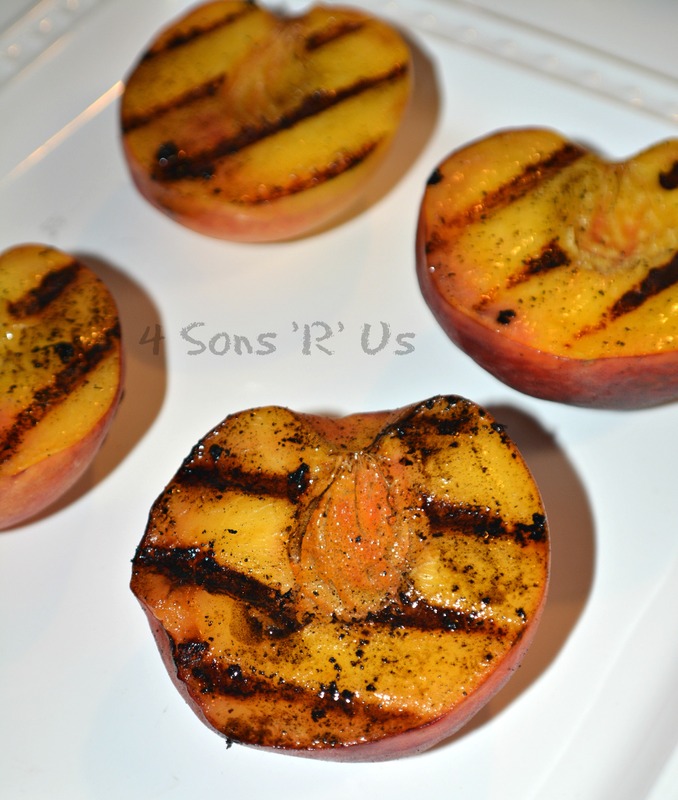 Brush the peach halves with a touch of oil, sprinkle each half with a pinch of brown sugar, and place them on the grill for a few moments and then rotate 90 degrees and continue to cook for about 3-4 minutes, grill marks will be present and the peaches will feel softer. 2. 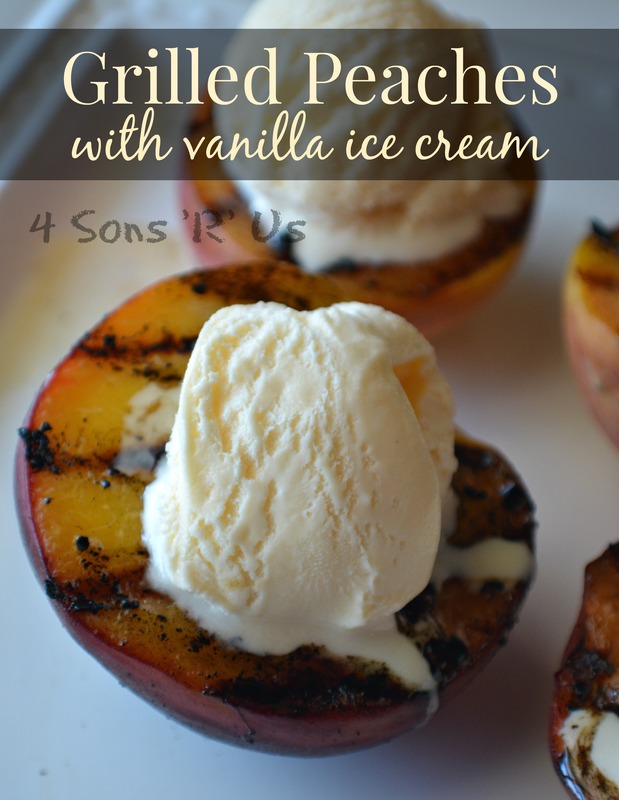 Remove from the grill with a pair of tongs and serve with a generous scoop of your favorite brand of vanilla ice cream in the center of each peach. Did you have a favorite cereal as a kid? The sons were subjected to the most heinous form of cruel and unusual punishment throughout their elementary school years, and only offered relatively sugar free cereal options, like cherrios, Rice Krispies, or raisin bran. They were horrified when I put the kibosh on them sprinkling spoonfuls of sugar over said plain fair (a trick Nanni had taught them). Still, I’m not totally against sugar, or even yummy sugary breakfast cereals. I’m just against them on most school mornings when they’re already wound tight enough with excitement. That and a sugar crash later will have them struggling through the end of the school day. on weekends, we’ve been known to get a little wild. 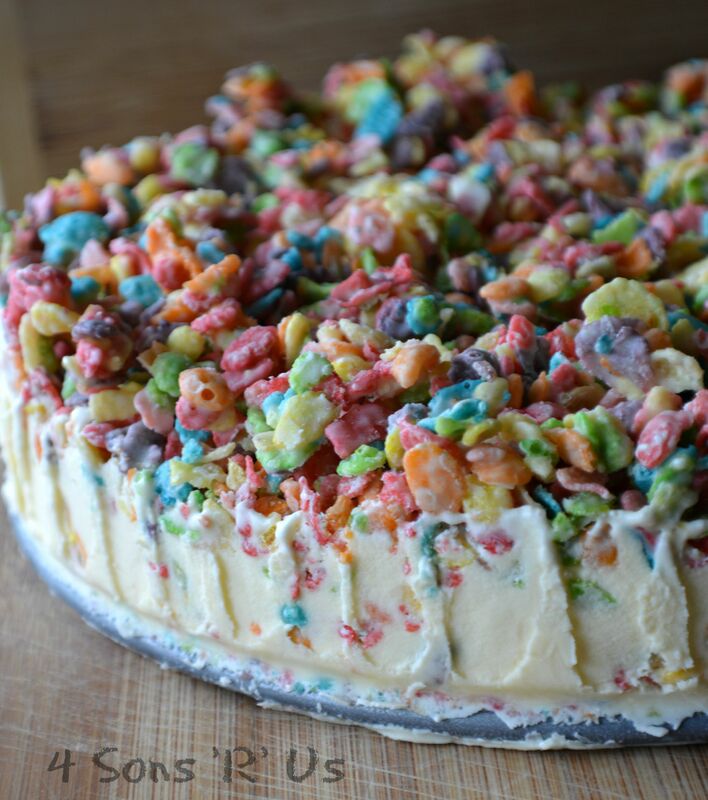 Like break out the fruity pebbles, and add some chocolate to make crunchy fruity pebble clusters, and adding those to some ice cream. You know, just for good measure and all. Breakfast is already acceptable for lunch and dinner, so why not bring a lil bit to the dessert table while we’re at it?! This cake is bright, it’s fun. It literally screams ‘summer vacation’. Kids of all ages will fall for it. 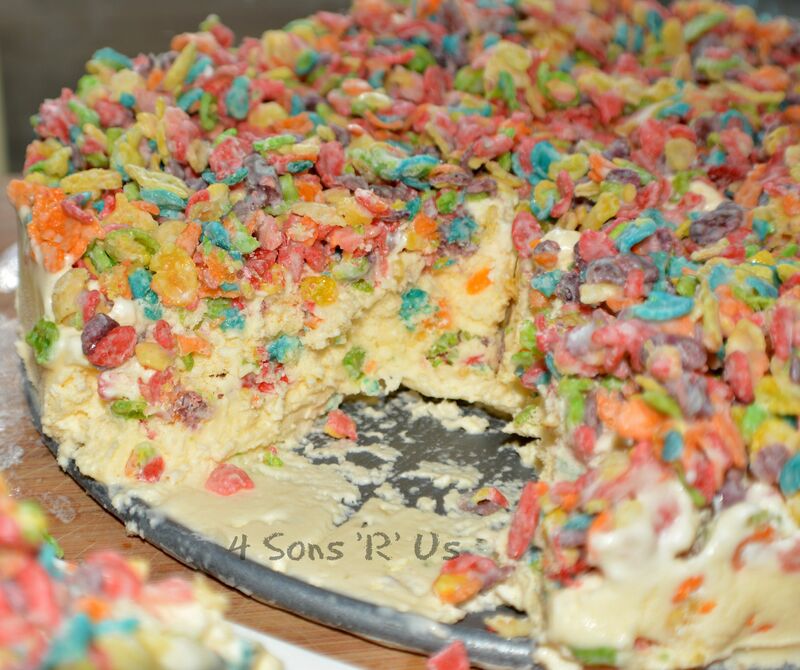 To make the Fruity Pebble Crunch Ice Cream Cake, start by placing half a gallon of vanilla ice cream in the fridge to soften. We want it soft, so it’s stirrable but NOT melted. 2. Put the cereal into a large bowl. Melt the white chocolate chips and shortening in the microwave, or you can use a double boiler for the same results. Pour the melted chocolate over the cereal and stir together until the cereal’s evenly coated. 3. Pour the coated cereal out onto a piece of parchment paper, gently spreading it out so its not a giant pile, but not necessarily an even layer either. Let the coated cereal sit, about 20-30 minutes, to allow the chocolate to harden and then break the cereal up into bite-sized chunks. 4. In the same large bowl, add the half a gallon of softened vanilla ice cream and quickly fold in the 2 cups of the crunchy cereal pieces. Again, quickly spread the ice cream mixture out into a 9-inch springform pan to avoid melting. If it melts it’s like pouring a liquid into the pan, which a springform pan cannot hold, and it will all run right out. Top with the remaining crunchy cereal bits and gently press it down a bit into the ice cream. 5. Cover the springform pan and place the ice cream cake in the freezer for 4-6 hours or overnight to harden. When ready to serve, remove from the freezer and slide a knife around the edges of the springform pan to release the cake and then remove slowly release the spring and loft the outer pan away. 6. Dip a butter knife in very hot water, quickly dry it off and use the hot knife to cut slices of the ice cream cake. Re-dip and dry the knife for each cut you make. The cake will begin to melt so work quickly and immediately return any uneaten portion to the freezer. Anybody who has little ones knows there’s something mesmerizing about any candy or treat that’s ‘gummy’. In this case, gummy bears. 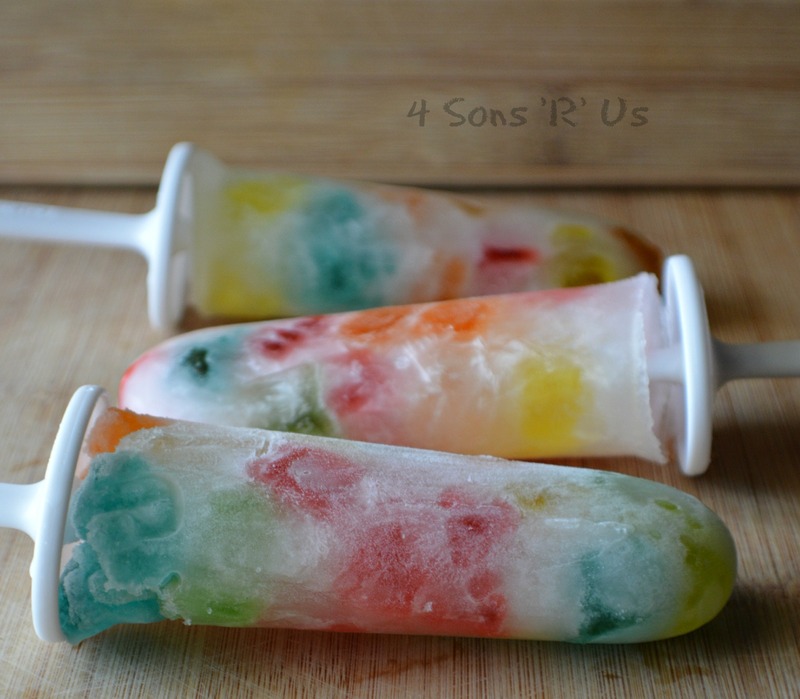 What little guy or gal, or big, or even the young at heart, wouldn’t love a special Popsicle made just for them with gummy bears hidden inside? These sweet treats are ice cold with a sweet, sticky surprise inside. They’re perfect pool side or as post-meal treat on any hot day. Whip em out at your next bbq, and you’ll instantly rise in ranks to the ‘hostess with the mostest’. Even better? They’re healthier than baked goods and they’re ice. cold. 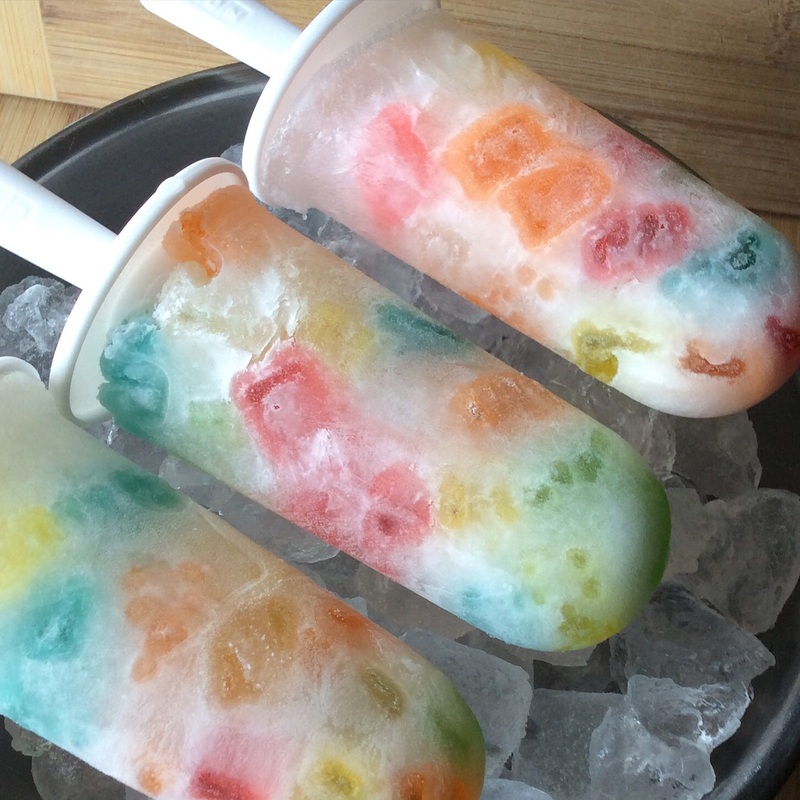 Are you sitting there thinking, damn those look refreshing, and fun, but I can’t make those because I’ve already broken through (at last estimate) 284 cheap Popsicle molds, and refuse to invest in another ( because let’s face it, even at a dollar a pop from the $ store, it adds up )? Well if you are, then you probably haven’t heard of Zoku’s Popsicle molds. These little things are awesome. The green part is just a base, and everything is designed for easy removal. Designed for easy cleaning and use, this classic mold design features 6 removable molds and 6 sticks with drip guards. When your pops are ready, you simply lift the individual molds from the base by pulling on the pop stick and run the mold under under warm water for just a few seconds to release the Popsicle within. It’s fool-proof. 1. Fill molds about 3/4 of the way full. 2. 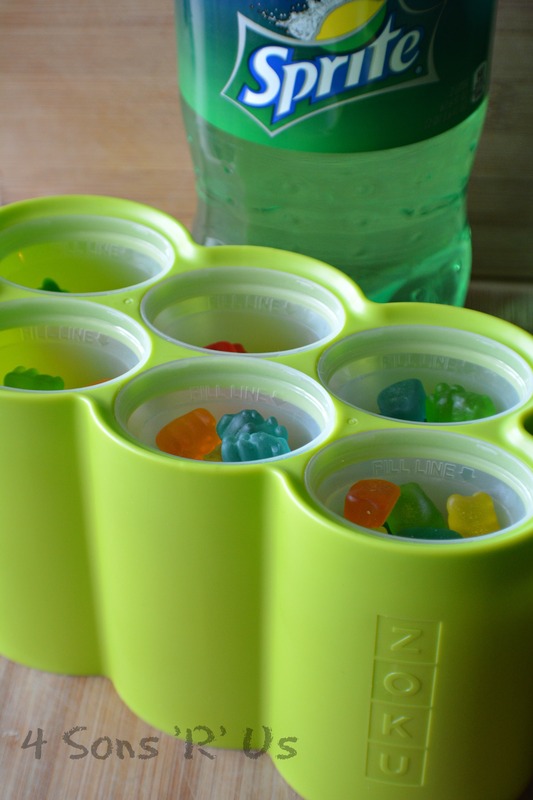 Drop in gummy bears. 3. Place popsicle stick into mold. 4. Freeze until frozen all the way through. Another late day again. (shh!) It happens. 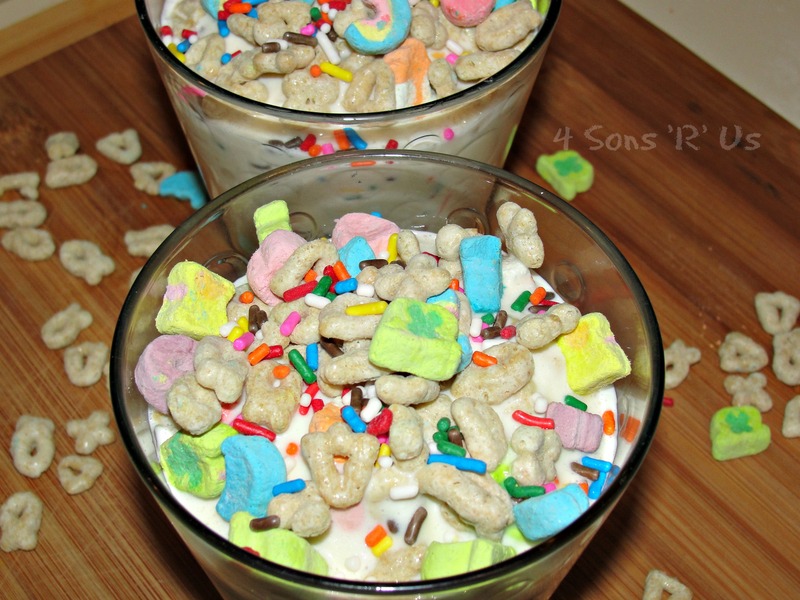 If you love Lucky Charms & milk, then this fun treat is going to blow. your. mind. 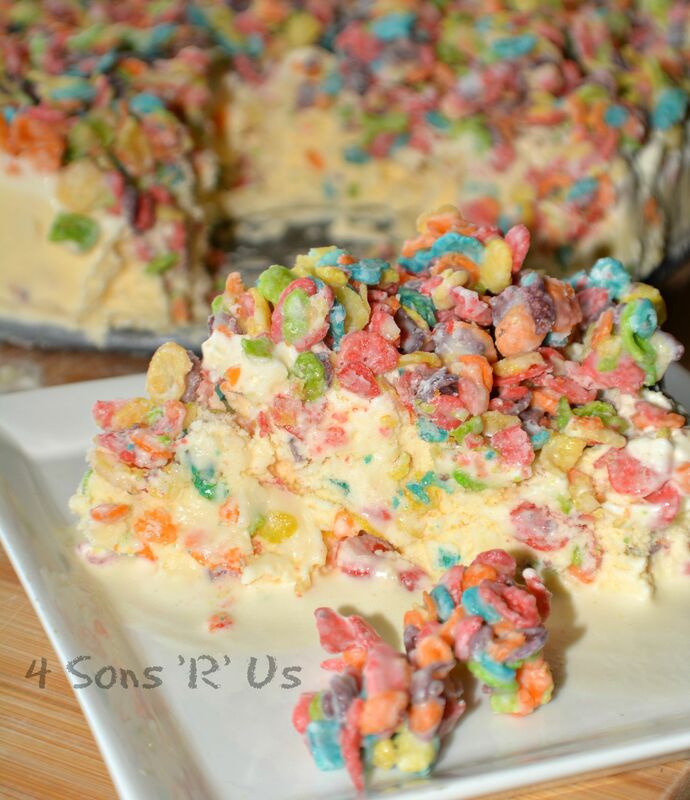 Everyone’s favorite marshmallow loaded cereal with ICECREAM! These are absolutely friggin’ addictive delicious. I’m honestly surprised this hasn’t become a ‘thing’, or the next big thing to hit the iconic Blizzard line. These were the perfect ending to our simple, yet ‘taste’ ful St Patrick’s Day meal. Thankfully, I had an extra carton of ice cream because everyone, sons and the Hubs included, came back for seconds. I had to put my foot down at thirds. While our blizzards featured Luck Charms, don’t just stop there. There’s a whole world of possibilities awaiting my fellow DQ lovers. Sub in your favorite treat to the base recipe and enjoy the sure-to-be splendid result. 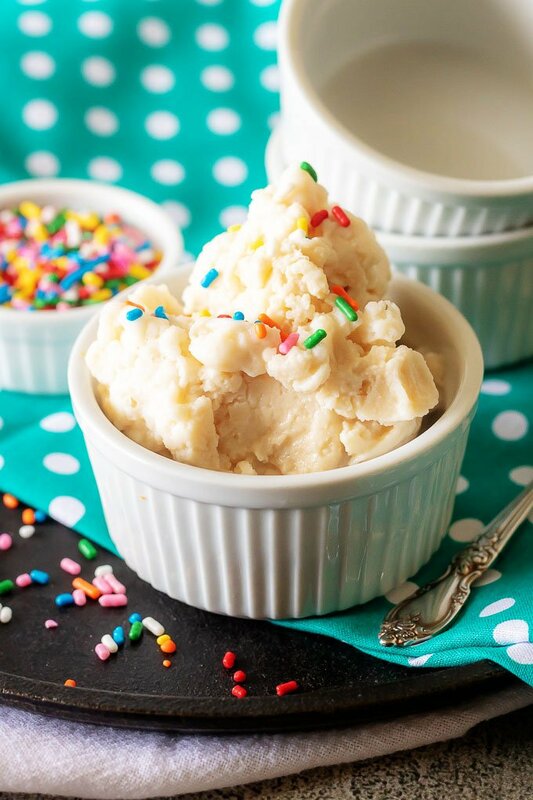 Place ice cream, milk and whipping cream in a blender and blend until smooth (should be thick). Stir in lucky charms cereal and sprinkles with a spoon. 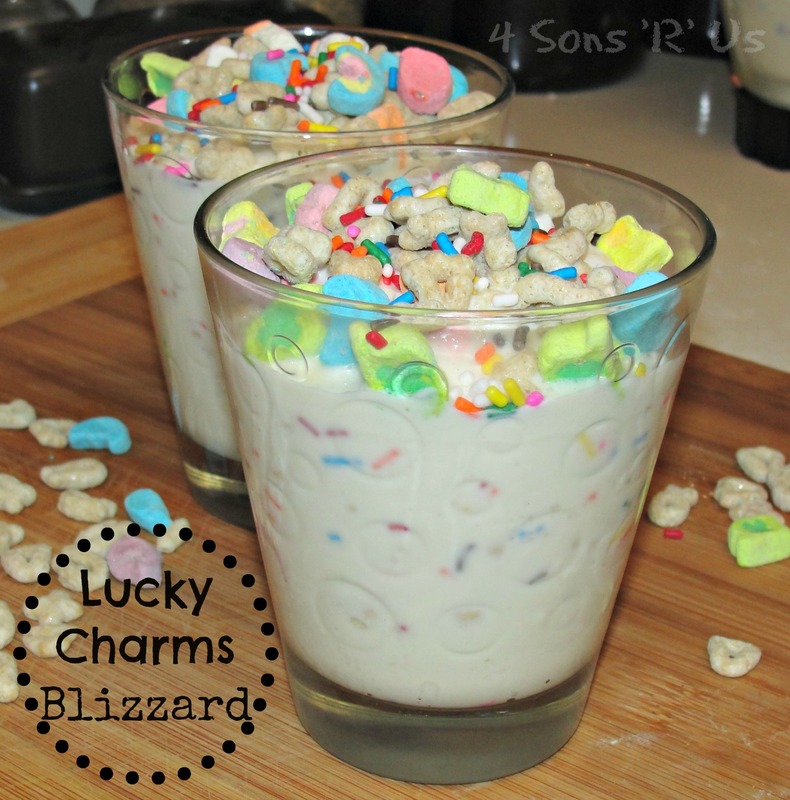 Pour into alarge glass (or two small glasses) and sprinkle with additional lucky charms (lots of marshmallows) and sprinkles on top. Serve immediately! Note this base recipe makes about two large servings. It’s easy to double or to do several batches if feeding a ravenous pack of wolves hungry boys. It’s not always feasible to load up the kids and swing by the store for one of our favorite treats. 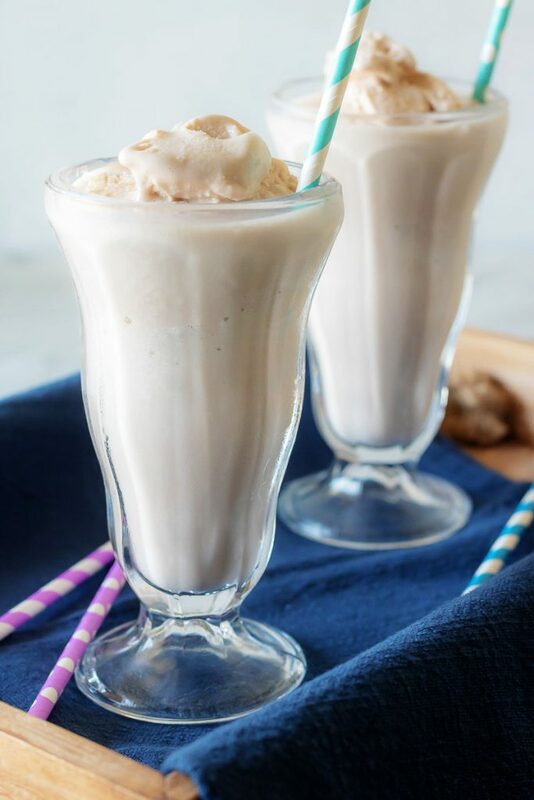 With this Copy Cat Wendy’s Frosty, we can enjoy our favorite frozen chocolate-y dessert whenever we want. Cool off your crew with a batch of this irresistible sweet treat.